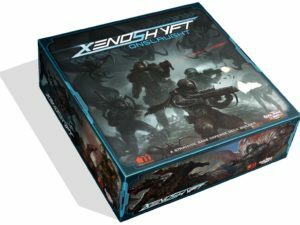 XenoShyft: Onslaught is a deck building game in which players take on the role of a military force that must defend their base against an alien species known as the Hive. The idea isn’t to defeat the Hive – that’s just impossible – but to survive nine rounds of onslaughts. XenoShyft: Onslaught was designed by Keren Philosophales and Michael Shinall, and it is published by CMON. In XenoShyft: Onslaught, each player defends the same base as a team. The base’s health track is determined by the number of players in the game, and they must keep the Hive from bringing that track down to zero. Each player has two boards in front of them, the NorTec / player board and the enemy board. The players begin the game with an identical set of 10 cards, but they also have their own unique cards and abilities based on their randomly-chosen divisions. As the game progresses, players add to their decks by purchasing items, equipment and more troops. Items and equipment are used to either heal the troops or make them more powerful. Enemies come in waves, with each wave being a bit tougher than the last. Each wave also has at least one boss that must be defeated in order to move on to the next wave. During battle, enemies are flipped over one at a time and they fight the soldier closest to them on the player board. XenoShyft: Onslaught has a total of nine rounds, and the players win if they are able to keep their base from being taken down. XenoShyft: Onslaught is basically a space marine game, which means it has a little bit of science fiction, war and strategy all mixed into one game. While the space marine theme has been done many times before, we still appreciated the way that it was implemented in XenoShyft: Onslaught. The fantastic artwork on the cards makes it very easy to imagine these soldiers taking on the aliens. Considering how much seems to happen while playing XenoShyft: Onslaught, it’s very impressive that it isn’t a long game. Since you’re going to be doing a lot of losing in this one, it’s nice that you can start up a new game and not worry about losing too much of your day. We also appreciate the fact that the designers took the time to make XenoShyft as cooperative as they possibly could. Sure, every game that we look at here on Co-op Board Games is cooperative, but some of them, such as Legendary : A Marvel Deck Building Game, do individual point systems or have traitors. That is not XenoShyft. You want to help your teammates as much as you can in this game because it is often your only hope of winning. 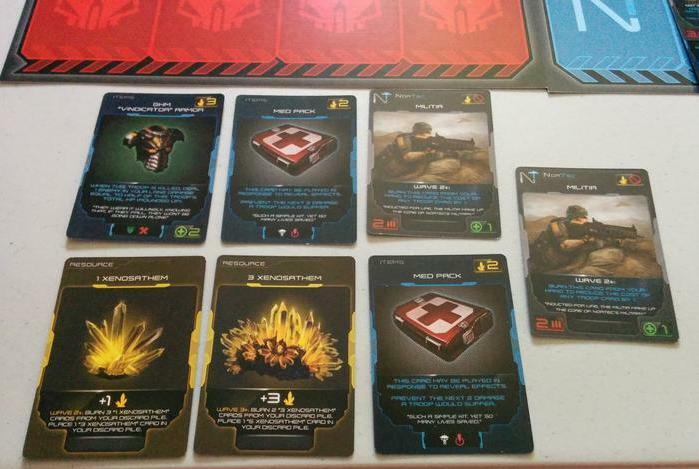 Like most cooperative deck building games, XenoShyft: Onslaught is extremely difficult to beat. We see that as a good thing, though, because we never felt like it was impossible. However, some players will be frustrated when they lose even though it felt like they did all that they could do to win. XenoShyft: Onslaught is an excellent co-op board game that is perfect for anyone who is looking for a challenging deck building game. If you are a fan of survival / horde modes in video games, you are pretty much guaranteed to love XenoShyft. XenoShyft has immense replay value, and they have already started to release expansions for it. It isn’t quite good enough to make it onto our best cooperative board games list, but it is one of our favorite deck building games (Update: It’s right outside of the XenoShyft: OnslaughtXenoShyft: Onslaughtop 5 now). You can test out the game by downloading the XenoShyft: Onslaught app on iOS, Android, or Steam. Thanks for taking the time to read our XenoShyft: Onslaught review!